In November, Parker and Wise counties approved a ballot measure to become a Tier-2 county – ending all forced annexation by home rule cities in our district. Right now, only 16 counties in Texas are Tier-2. This leaves 238 counties without protection! Many others are collecting signatures to be on the May ballot but as our community knows, this is a very arduous process. I have filed HB 347 that would end the need for county to county elections and end forced annexation for all Texans once and for all. We are one of the few states that allows the practice of involuntary annexation by our home rule cities. Forced annexation is un-Texan and protecting private property rights of ALL citizens is simply the right thing to do. Having Parker and Wise counties lead the charge last November and pass this measure with overwhelming support has built a foundation with great momentum to end all forced annexation this legislative session. Thank you to everyone that worked so hard last year to make Parker and Wise counties Tier-2 status. This week Governor Abbott addressed all Texans and members of the legislature to promote legislative priorities for this session. Texas is leading the nation in job creation and has the fastest growing economy in America. We are the top oil and gas producer and a leader in exports. We need to continue to look for ways to promote innovation, jobs and good regulatory environment. Student achievement is top priority which means ensuring our best teachers are in the classroom serving our students. More state funding will be necessary to invest in our students, teachers and to ensure schools are properly funded. No government should have the ability to tax its citizens out of their homes. Our school finance system is too dependent on local property taxes. We need to limit property tax growth, lower property tax bills and increase the state share of spending on education. 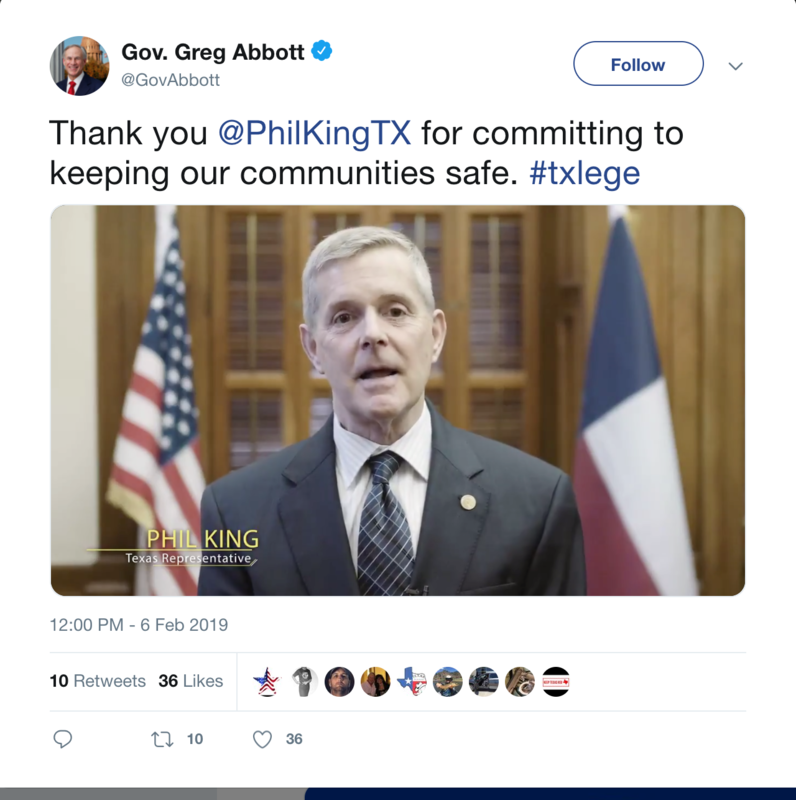 Our number one priority is keeping Texans safe and investing in resources to combat gang violence, human trafficking and equipping law enforcement to keep us safe. Hurricane Harvey was the costliest and most destructive storm in our state’s history. This session we will be looking at additional financial means to support our local communities as they continue to recover. We need to ensure our students are safe at school and the state will allocate the necessary resources to school districts for mental health programs, additional law enforcement and school hardening. Last week I was delighted to have Jonathan Catlin serve as an Honorary Page for the day. 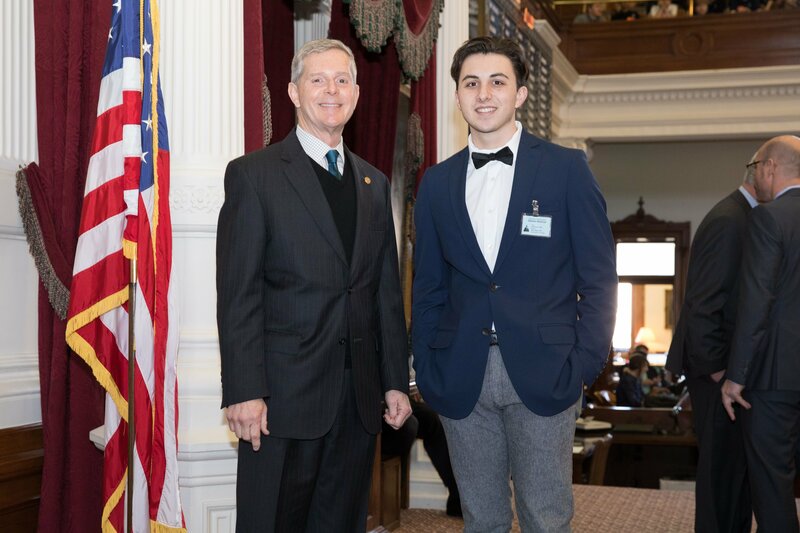 The Honorary Page Program allows students between the ages of 8 and 18 to experience the Texas legislative process first-hand. Honorary pages are able to join Representatives on the House floor and shadow pages as they fulfill their duties around the Capitol. I always enjoy having young Texans join me to learn about their state government.